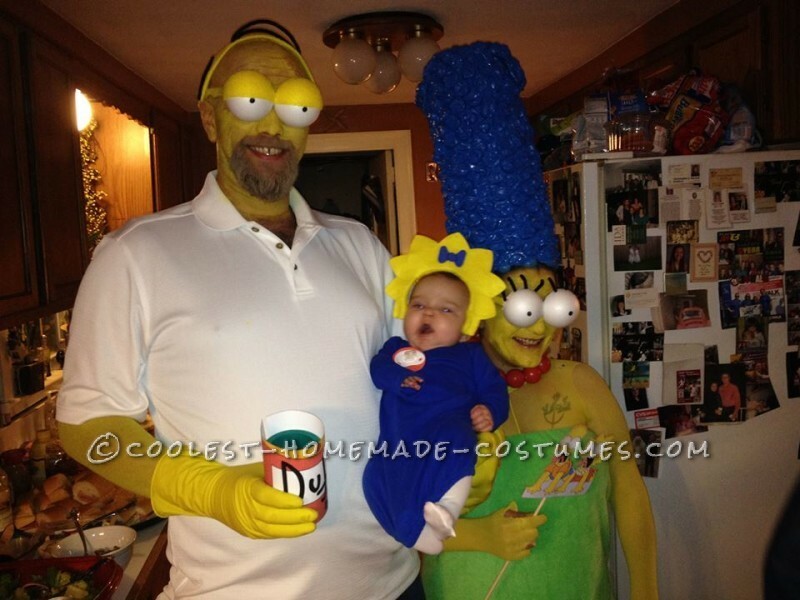 I wanted to dress my daughter as Maggie for her first Halloween and ran with the idea by having my husband and I dressing as Homer and Marge. 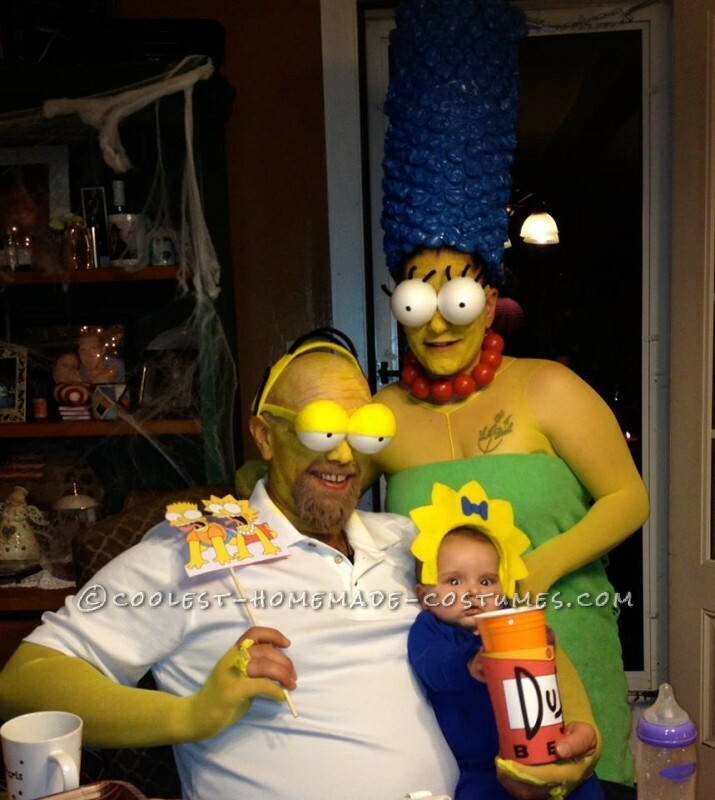 Although it seemed to be a fairly easy costume to make, it took me about 2 weeks to make. 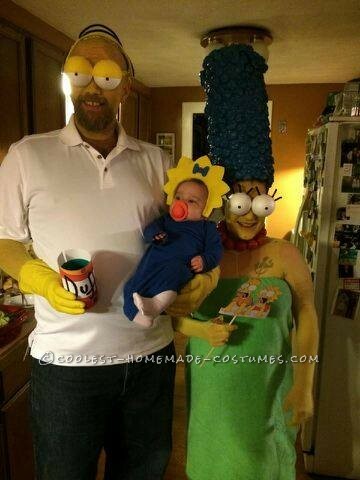 I made everything except for Homer and Maggie’s clothes. I made the eyes by cutting Styrofoam balls in half and gluing them to plastic glasses. 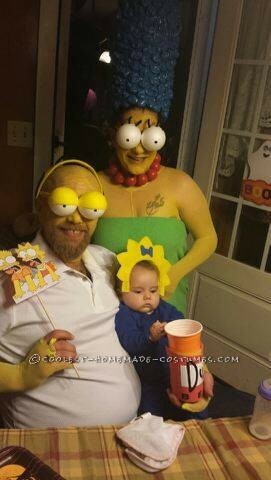 Homers eyelids are felt and Marge’s lashes are pipe cleaners. I bought 3 pairs of yellow nyons which I cut a hole in the crotch of one pair to put over my head and used the legs as sleeves. Another pair I cut the legs off for Homers arms (I attempted to make them gloves but my husbands hands were too big so they ripped), and the third pair I left as-is for my legs. I drilled small holes in the Styrofoam balls and colored them black with a marker. They were hard to see out of, so we only used them for photos. I made Maggie’s hair with felt I glued onto a headband and I put red craft foam around a red handled pacifier. Homers hair is also a headband made with felt and pipe cleaners. I constructed Marge’s hair by gluing bubble wrap to poster board and spray painting it blue. Her necklace is Styrofoam balls I painted red and I hot glued red felt to my slippers to make her shoes. For an added special touch, I printed out a Duff label and put it around a drink koozie and a picture of Bart and Lisa and glued them to a wooden dowel.